UPDATE: The Adobe Buzzword and Workspaces suite was discontinued. This information remains as a part of Lifewire.com's archives. Adobe Buzzword was a web-based word processing app that was part of the company's Workspaces suite of productivity applications, which also included a spreadsheet app called Tables and a presentation app called Presentation. Buzzword and the Workspaces suite were similar to Google Docs and its suite of applications. Where Did Buzzword Come From? Buzzword was developed by the company Virtual Ubiquity, which was acquired by Adobe in October 2007. 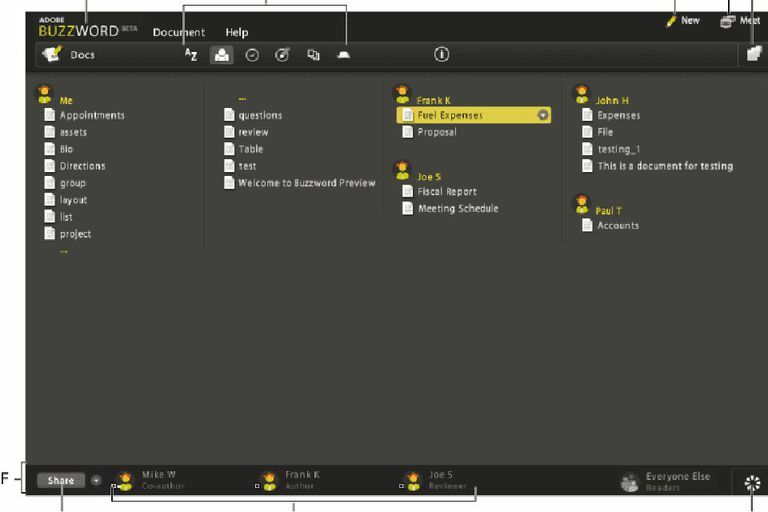 Buzzword and other Workspaces apps were features available through Acrobat.com. "Adobe is exiting the document authoring business for word processing, spreadsheets, and presentation files. Our focus will be to continue to provide world-class PDF creation and conversion products and services that enable our customers to take actions on their files anywhere on any device."